It all began over 40 years ago when Billy Kidd, Steamboat’s Director of Skiing, and Larry Mahan, six-time All-Around World Champion cowboy, decided to invite a few of the ProRodeo stars to Steamboat for a day of skiing. The cowboys had such a great time that the Downhill has become the most popular event of the season with over 100 of the best professional rodeo cowboys competing in the most unique ski rodeo in the country. Sponsored by Bud Light, the Cowboy Downhill is always scheduled to coincide with the National Western Stock Show in Denver and the action busts out of the starting chutes at 1:00pm on Stampede on Monday, January 21. Festivities kick off in Gondola Square with a 4H petting zoo, roping clinic and the Denver Bronco Cheerleaders. After the race, kick up your boots with a free concert as part of the Bud Light Rocks the Boat Concert Series. 11:00am: Festivities kick off in Gondola Square with an afternoon of western celebration featuring a 4H animal petting zoo, appearances by the Denver Broncos cheerleaders, a learn to rope clinic, limited edition Bud Light Cowboy Downhill logowear, AND MORE. 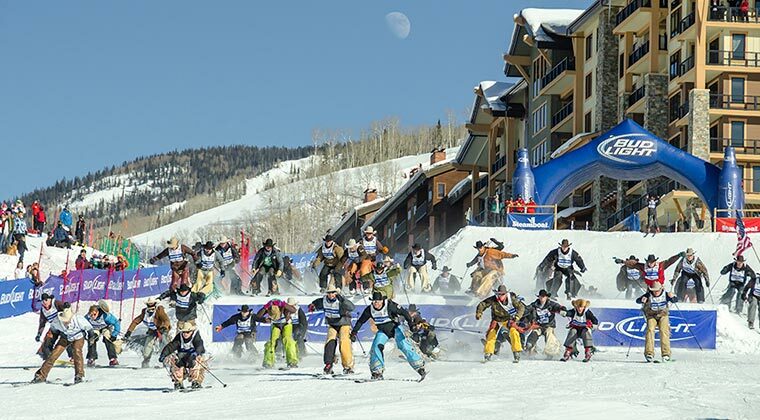 7:00pm: The Cowboy Downhill Awards Banquet will take place Monday January 21, 2019, from 7:00pm - 11:00pm in the Champagne Powder Room at the top of the gondola. We'll have a great western BBQ spread overlooking the Yampa Valley and the town lights below. There's limited availability for this night so make your reservation today. Mountain Resorts is one of the largest and oldest property management companies in Steamboat Springs. We are Steamboat's Lodging Expert, with over 350 condominiums to offer you. Our goal is to help make your Steamboat vacation a truly memorable experience by exceeding your expectations in accommodation and service. Our condominiums range in size from cozy, economical studios to luxurious four bedroom, four bath units all located at or near the ski area base.